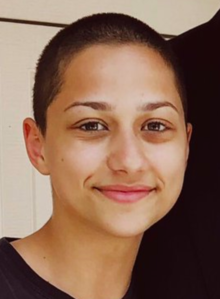 Emma González (born 11 November 1999) is an American activist, a former Marjory Stoneman Douglas High School student, and a Stoneman Douglas High School shooting survivor. In a little over six minutes, 17 of our friends were taken from us, 15 more were injured, and everyone, absolutely everyone in the Douglas community was forever altered. Everyone who was there understands. Everyone who has been touched by the cold grip of gun violence understands. Fort Lauderdale, Florida, February 17, 2018 ( CNN Staff (February 17, 2018). "Florida student Emma Gonzalez to lawmakers and gun advocates: 'We call BS'". CNN. Retrieved on September 24, 2018. ; Hayes, Christal (February 17, 2018). "Emma Gonzalez survived the Florida shooting. Now she’s taking on Trump and the NRA". USA Today. Retrieved on September 24, 2018. ; Turkewitz, Julie; Stevens, Matt; Bailey, Jason M. (February 18, 2018). "Emma González Leads a Student Outcry on Guns: 'This Is the Way I Have to Grieve'". The New York Times. Retrieved on September 24, 2018. ; Witt, Emily (February 17, 2018). "Calling B.S. in Parkland, Florida". The New Yorker. Retrieved on September 24, 2018. ). 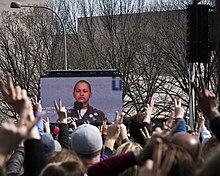 At March for Our Lives in Washington D. C. (24 March 2018) ( Lucero II, Louis (March 24, 2018). "What Emma González Said Without Words at the March for Our Lives Rally". The New York Times. Retrieved on September 23, 2018. ; Reilly, Katie (March 24, 2018). "Emma González Kept America in Stunned Silence to Show How Quickly 17 People Died at Parkland". Time. Retrieved on September 23, 2018. ; Andone, Dakin (March 25, 2018). "Emma Gonzalez stood on stage for 6 minutes - the length of the Parkland gunman's shooting spree". CNN. Retrieved on September 23, 2018. ; Epstein, Kayla; Amenabar, Teddy (March 24, 2018). "The 6 most memorable speeches at the March for Our Lives in D.C.". The Washington Post. Retrieved on September 23, 2018. ). González, Emma (5 October 2018). "A Young Activist’s Advice: Vote, Shave Your Head and Cry Whenever You Need To". The New York Times. Retrieved on October 5, 2018.